The Quick Digestive Aid Cleanse consists of a group of herbs and nutraceuticals that work in a synergistic manner for optimal cleansing. All the ingredients in this cleanse are made in accordance with both cGMP and Dr. Hulda Clark’s protocols. The colon is closely dependent on the stomach, liver, kidneys and pancreas. Therefore do not focus only on the colon; focus on the entire digestive system. The 60 – 80% body’s energy is used on digestion, that’s why you should support the digestive system. Supporting the digestive system will improve digestion, and free up energy to be used elsewhere in the body. Supporting the digestive system will allow the body to spend sufficient energy on all the other systems. Betaine HCl supports the stomach’s acid requirements for proper digestion. It breaks down proteins, activates enzymes and strengthens the acid barrier. This protects the colon from bad microbes and maintains the microorganisms and flora balance. Turmeric and fennel support optimum balance of good flora and microorganisms in the colon. Papain and pepsin are enzymes that help to break down proteins in the digestive tract, which allows amino acids to be absorbed and transported within the body. Balances stomach acids to ideal level. Balances intestinal organisms and flora. Helps relieve irritation due to occasional gas and bloating. Helps maintain a flat tummy. Always take with breakfast, lunch and dinner, or as directed by a health care professional. The first day take 1 capsule 3 times. From then on take 3 caps 3 times daily. This cleanse is the first of four cleanses. For best results continue taking the Digestive aid cleanse while on the ParaZap, Kidney, and Liver & Gallbladder cleanses. 2. 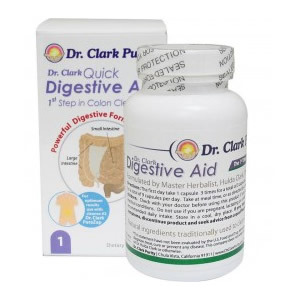 The Dr. Clark Digestive Aid works synergistically with the ParaZap Cleanse. For even better results take those two programs over the same time period. You will gain on two fronts at the same time; while the ParaZap Cleanse will balance foreign organisms systemically throughout your body the Digestive Aid will optimize your digestion in both your stomach and intestines.